I recommend visiting today's Arcana page. Click on the Eye of Ugin!!! This is our first example of an Eldrazi spell that you can cast more cheaply with Eye of Ugin. You can search for it with the Eye as well. It's colorless (but not an artifact). And the border is totally different. It costs 10 mana for a 12/12. The way it is worded, this won't trigger if you just put it into play; you must cast it as well. Presumably from your hand. Annihilator is a new keyword! That means you can probably expect to see it on more creatures. Permanents getting sac'ed left and right. In a land of Eldrazi, this makes a lot of flavor sense. 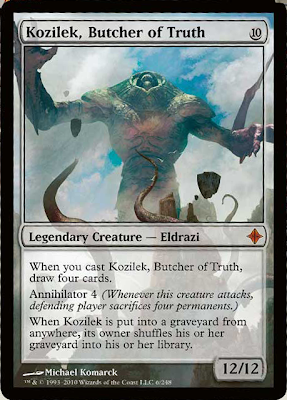 When Kozilek, Butcher of Truth is put into a graveyard from anywhere, its owner shuffles his or her graveyard into his or her library. No more Graveyard shenanigans for you! It seems the Eldrazi don't like staying in graveyards for very long. This way, you can't use reanimation strategies to cheat Eldrazi into play either. It's also an interesting way to fight milling strategies - with just one of these in your deck, your opponent will have a hell of a time trying to mill you.